Credit: Ajay Suresh licensed under CC BY-SA. Credit: Kei Mashimo/CC BY-ND 2.0 licensed under . Credit: Andrea Schaffer licensed under CC BY-SA. Credit: Kabacchi licensed under CC BY. The town that never sleeps describes Shinjuku ward accurately in one sentence. Its main train stations sees more than 3.6 million commuters passing through it every day — making it the busiest in the world. Shinjuku is one of Tokyo’s 5CW, the five central wards. Located on the west side of the city centre, it borders three other central wards (Shibuya, Minato and Chiyoda). The main train stations include Shinjuku, Shin-Okubo Station on the Yamanote Line and Okubo and Yotsuya on the Chuo Line. Access to almost anywhere is quick and easy from Shinjuku. The area west of Shinjuku Station is dominated by office towers and luxury condominiums, making the ward an increasingly popular choice with both affluent Japanese and expats. The wider area around the station is densely packed with restaurants and cafes bustling with office workers during lunchtime. On weekends, students, young couples and families visit the many malls in the area for shopping sprees. At night, Shinjuku really comes to life with its many illuminating neon signs. Restaurants, izakaya, bars, cinemas and game arcades make up the harmless side of the nightly entertainment, but north of Yasukunidori Street, the Kabukicho entertainment district also tempts lonely businessmen with an expansive red-light district. In the past years, the Tokyo Metropolitan Government has undertaken efforts to clean up the area's seedy image for the upcoming Olympics. The district now offers a mix of reputable and questionable establishments sharing walls, but the perception still remains. Besides all this hustle and bustle, visitors will be surprised to find that Shinjuku is also home to one of Tokyo’s most expansive Japanese gardens, Shinjuku Gyoen, and one of the city’s most important shrines, Hanazono Jinja that holds several major festivals several times a year. Shinjuku is infamously the busiest transportation hub in the world with an entry into the Guiness Book of Records. The station has 36 platforms and well over 200 exits, making it a maze even for seasoned Tokyoites. 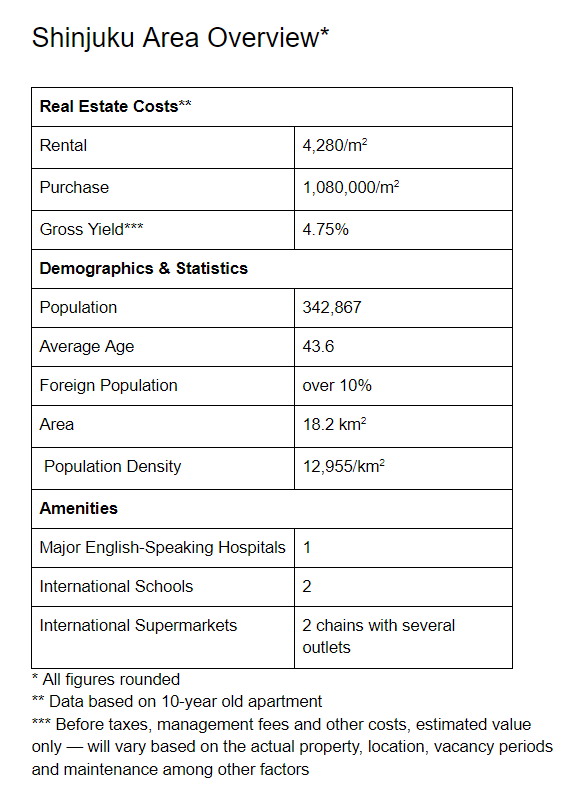 342,867 residents call Shinjuku ward their home. With a population density of 18,855, it is one of the most densely populated areas of Tokyo. A total of 41,704 foreign residents are registered in Shinjuku-ku, making it the highest total foreign population and also the highest percentage of internationals in any of Tokyo’s 23 wards. At the same time, the ward is relatively small with an area of 18.22 km2. It is bordered by some of the other C5W, namely Shibuya and Chiyoda and Minato, and Nakano, another popular residential area for both Japanese and foreign residents. The average age in Shinjuku is 43.6, making it one of Tokyo’s youngest wards, probably owing to its hustle and bustle nature and extremely central location in the midst of the urban sprawl. Shinjuku offers anything you could ask for in a metropolis. The area around Shinjuku Station is one of the city’s most popular shopping destinations and gets extremely crowded on the weekends. Japan’s oldest and most illustrious department store, Isetan, is located here. Other high-end department stores include the Odakyu and Takashimaya, both connected to the station. Younger crowds tend to favour malls, with several Lumine malls connected to the various exits of Shinjuku Station and several Marui malls placed on the high streets of Shinjuku. Seijo Ishii and Kaldi Coffee Farm, two chains of smaller international supermarkets, operate several branches in Shinjuku ward, with one Seijo Ishii located right in Shinjuku Station. The biggest international hospital with English-speaking physicians on duty is the National Center for Global Health and Medicine. There is no shortage of gyms in the ward. The 24-hour chain Anytime Fitness operates several branches and other popular Japanese chains like Rizap and Joyfit are also represented. One of the biggest gyms offering a large training area, courses, a pool and a sauna is Tokyu Sports Oasis in Kabukicho. There are two international schools located in Shinjuku. Tesoro is a co-ed international pre-school and Tokyo Waseda International Christian School is a co-ed school from elementary through to high school. Major stations of Shinjuku are Shinjuku, Takadanobaba (where Waseda University is located), Okubo (home of Koreatown), Kagurazaka (known for its quiet streets lined with traditional restaurants), Ichigaya, and Yotsuya (Sophia University). From Shinjuku, it takes about 7 minutes to Shibuya and 13 minutes to Tokyo Station on the Chuo Express Line. The Narita Express takes you directly to Narita Airport in approximately one hour and around 50 minutes to Haneda Airport. As one of the C5W, Shinjuku real estate is some of the most expensive in Tokyo to buy or rent. The square metre price for new properties, up to 5 years old, is JPY 1,175,000 on average. Considered almost fully depreciated, 20-year-old properties go for JPY 910,000/m2, while the price decreases to JPY 795,000 for properties 30 years or older. Rent per square metre clocks in at JPY 4,570 for new properties up to 5 years old and progressively decreases to JPY 4,280, JPY 3,810, and JPY 3,550 yen for properties 10, 20, or 30 years old, respectively. The best yields for investment properties are achieved with older properties. A property of three decades or older can yield and ROI of around 5.3%, while a new property would on average only return around 4.6% gross yield before taxes and other deductions.